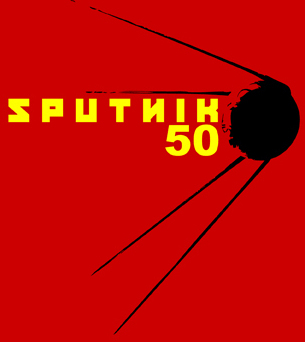 Sputnik: 50 years of Space Exploration. 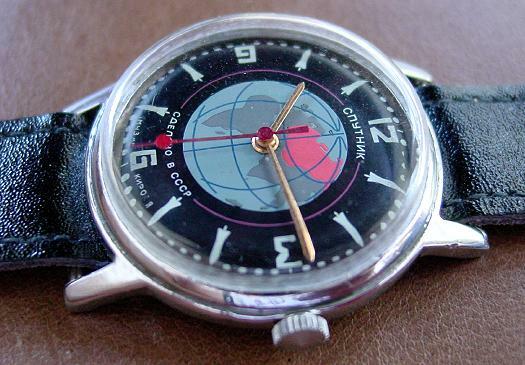 A late 50's watch was made at the First Moscow Watch Factory (1Mchz) commemorating Sputnik-1, the first artificial satellite to be put into orbit around the Earth. 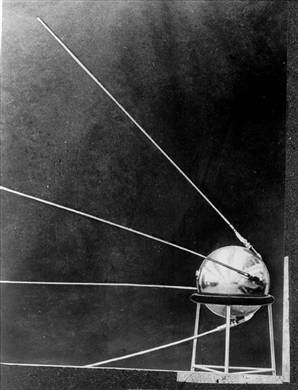 'Sputnik-1,' or PS-1, for 'Prosteishiy Sputnik' — the Simplest Satellite, was launched on 4 October 1957. This watch is all about the dial. 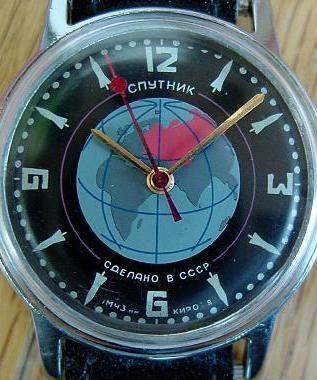 The Earth is clearly in the center with the Soviet Union in red. 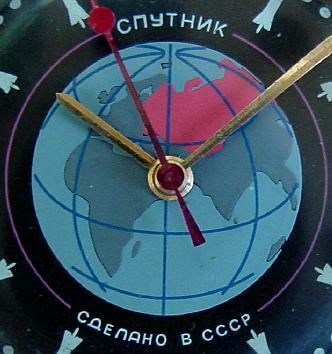 The seconds hand could represent Sputnik herself orbiting around the Earth, her path marked by the thin red circle. You can see there are rocket ships marking off the hour increments, except at 12, 3, 6 and 9 (Sputnik was launched by the rocket R-7 Semyorka). I like how the numbers expand a bit toward the periphery. The crystal is unusual, or might simply be the wrong crystal for the watch; you can see it is super tall, rises up from the case more than in most watches. The sides are rough and opaque and I think are meant for adhering into a deeper set into the case. This watch has elements which have been cobbled together. The case is simple. The original case is more ornate. Though not authentic, I actually like this simple case better. 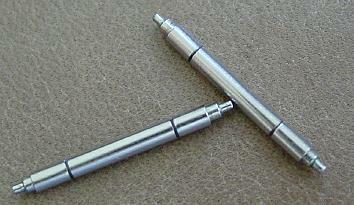 The minute and hour hands are not original, should be steel color. 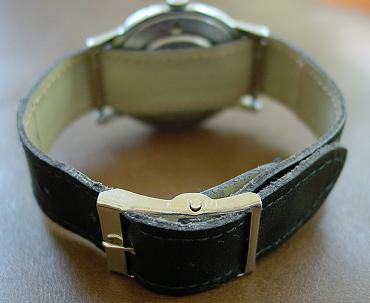 The caseback is screw-down. I am virtually certain the dial on this particular watch is a fake or at least not an original 1950s version. Click here to read why. The lead-up to Sputnik had its roots in the emerging tensions between two former wartime allies, as they differed on how to reconstruct the postwar world. Soon after the end of WWII the Cold War between the United States and the Soviet Union had already begun. With this background, both nations sought advantages in all arenas including military, political, scientific and technological. Amidst this environment, the International Council of Scientific Unions, announced in 1952 an upcoming International Geophysical Year, to commence 1 July 1957, lasting actually eighteen months to 31 December 1958. The ICSU, founded in 1931 and based in Paris, promoted a kind of 'science without borders' and the IGY was 'intended to allow scientists from around the world to take part in a series of coordinated observations of various geophysical phenomena.' 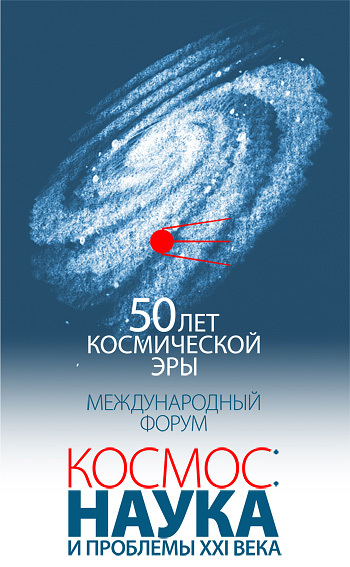 (1) Both the United States and the Soviet Union were participants, and each announced plans to launch artificial orbiting satellites during the IGY. 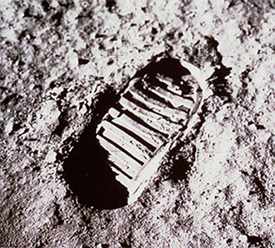 What might have began as a 'healthy competition' among scientists led ultimately to an overwhelming Soviet triumph, a 'Sputnik Crisis' for the United States, the beginning of the Space Race and indeed the Space Age. 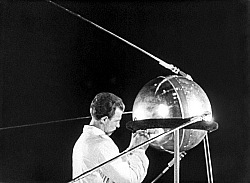 Technician and Sputnik-1. With four long antennae, it weighed 183 pounds, and took 98 minutes to orbit Earth, traveling at 18,000 mph. Sputnik-1 was carried aboard an R-7 rocket like this one, launched at the later-to-be named 'Baikonur Cosmodrome.' 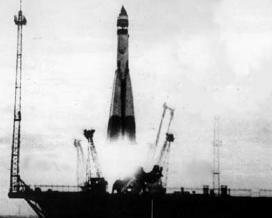 Do you just love the word 'Cosmodrome' A photo of the actual launch is below. 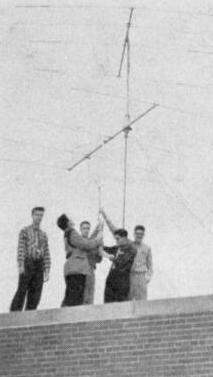 U.S. high school radio operators erect an antenna, to receive radio signals from Sputnik. 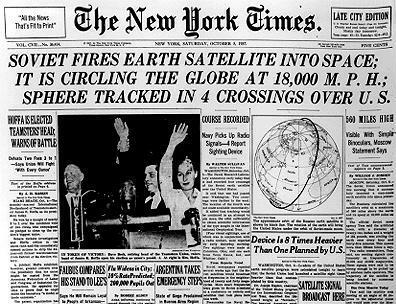 The satellite transmitted for 21 days, until it's batteries ran dead, though the satellite continued to orbit for a few months. 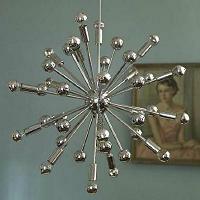 Sounds of Sputnik. 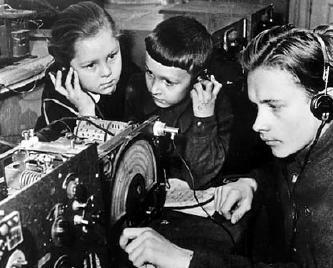 Russian children listen to radio signals from the satellite. In the aftermath, American education was questioned and many considered Soviet education superior. These children, therefore, were probably absolutely brilliant. The girl looks the smartest. 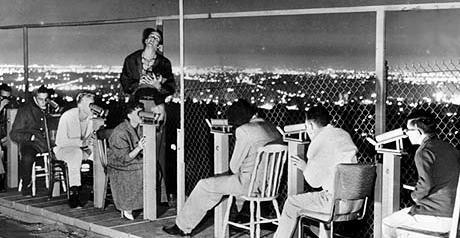 In Los Angeles, members of the public gaze at the heavens in search of Sputnik. 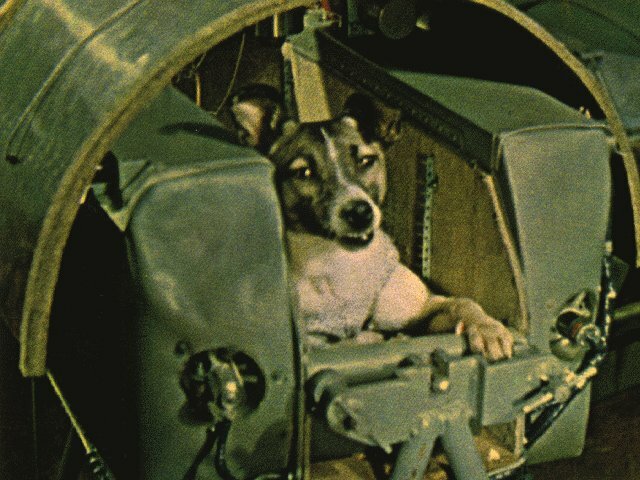 Laika, Earth's first living space traveler inside Sputnik-2. Telemetry showed she perished in her craft after just a few hours, from heat and possibly anxiety. 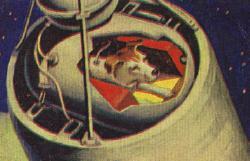 But proving that creatures can survive liftoff and weightlessness, Laika blazed a trail for eventual human spaceflight. LIFE Magazine 21 October 1957. Sputnik cover story. 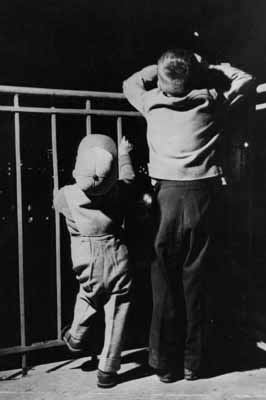 This photo is said to show nighttime launch of the actual R7 rocket which carried Sputnik-1. I don't have confirmation of this, and some say there either are no photos of the launch, or they have never been released. 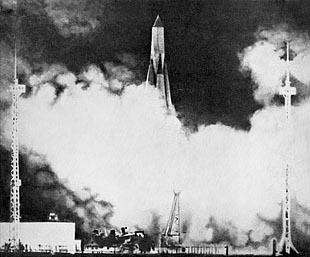 Offical photograph, as publically released by the Soviet Union; it is possibly the only photograph of the actual satellite which went into space. 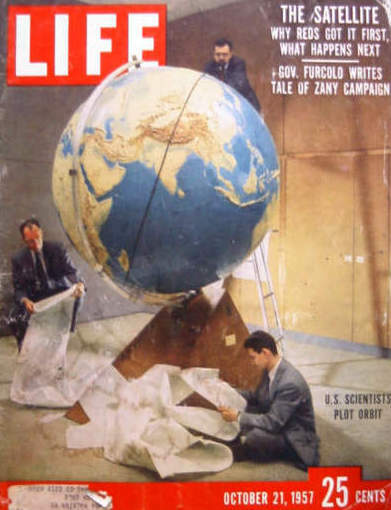 MIT scientists make the cover of LIFE, as they track Sputnik.